Saint Thomas Church, Meekness and Faith (1930) Stained Glass Window by James Humphries Hogan of James Powell & Sons (Whitefriars), Ltd. This window is in the Chantry Chapel also known as The Lady Chapel, which is dedicated to Our Lady, Saint Mary the Virgin. There are four windows in the chapel-all in honor of women in the Scriptures. One window was completed in 1929 and the other three in 1930. This window is Meekness and Faith, which is furthest from the altar. On the left side, which represents Meekness, is Saint Helena and Saint Elizabeth of Hungary represents Faith on the right side. The four windows were made possible by donations from the Burden family. The left window says “The Glory of God and in Memory of” and the right hand side “Alice Twombly Burden Born 3 Jan. 1905 Died Feb. 6 1905”. Thanks to David Daniel at Saint Thomas for information on the windows. James Humphries Hogan (1883-1948) designed stained glass windows at Saint Thomas including this wondow. He was a noted stained glass artist for James Powell & Sons (Whitefriars), Ltd. of London from age 14 until his death in 1948. He made windows for many of England’s churches including the 100 foot high central windows of Liverpool Cathedral. 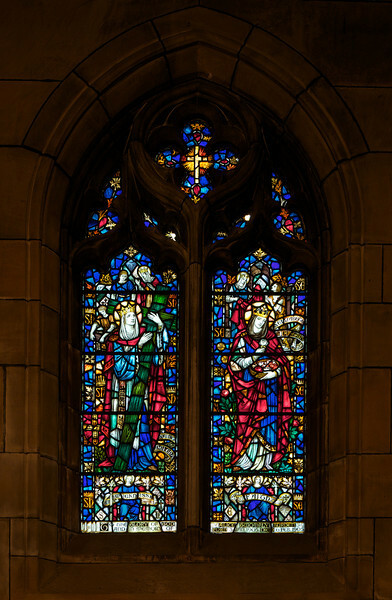 Some consider the windows at Saint Thomas to be some of the finest designs. The firm of James Powell and Sons, also known as Whitefriars Glass, was an English glassmaker and stained glass window manufacturer. The company started in the 17th century but became well known as a result of the 19th century Gothic Revival. In 1962 the company name was changed back to Whitefriars Glass Ltd. It specialized in freeform glass ware until Caithness Glass purchased the firm in 1981. See Wikpedia for more detail. In 2007, conservation began on the windows. It required three years and $20 million to restore the 9 million pieces of glass. The largest windows each required 4,500 man hours, the labor of one artisan for two and a half years. See the Saint Thomas website and a New York Times article for more detail.